Happy, happy Friday my lovelies! Today I'm trying to remind myself that despite my longing for the colour of spring we're still in mid-winter here. The snowdrops are only just blooming here in Edinburgh and the skies are still quite grey. I feel like I'm caught between two seasons, almost in a state of limbo. 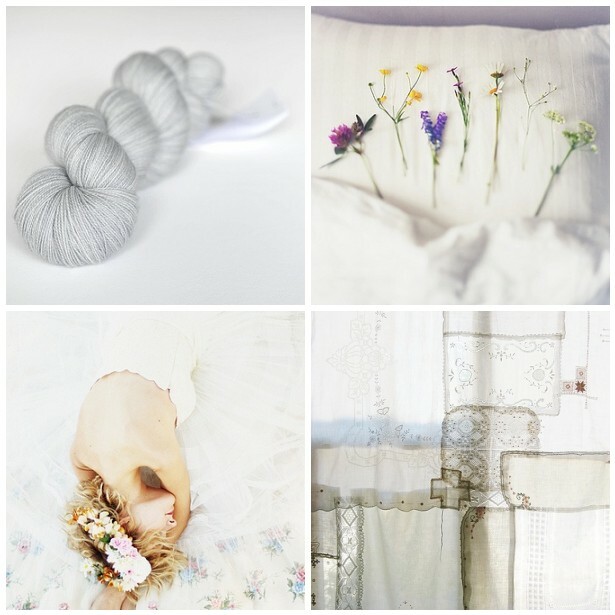 So there we have the inspiration behind today's palette ~ cold winter whites and soft lilac greys with snippets of colour from wild spring flowers, warm yellows and purples with bold spring greens. It reminds me of this crocus inspired cushion cover I made a while back. Now I'm going to have to love you and leave you, until Monday that is! It's just that I have a lot of organising and crocheting on the to do list this weekend so I'm going to sign off early. I promise to tell you what it is all for very soon. Beautiful palette! How amazing is Dottie Angel? -- that curtain is gorgeous! I want spring! But you're right, we seem to be caught between seasons. Today we even had a bit of snow here in Copenhagen! It's nice to 'meet you' I love that there are little photos of you and the wee man on top of the blog - nice to picture people. I'm spending some of Sunday drifting around on the internet, finding new people to follow etc. I love your blog - the feel of it is so light and pretty. The flowers in the top right are gorgeous. Just the kind of inspiration I need to do some product photography of a flower press in the coming days. ps I had a look in your shop - the flower garlands are really lovely. Delicioso blog.Una suerte poder disfrutar de tus colores y tus creaciones.